I went back to Dakota Prime today for lunch along with a friend. I had already tried the lunch set on my last visit, so I was looking to try out something else. One of my friends had highly recommended the Reuben sandwich there, so I was debating between that and the 1/2 pound Prime & Kobe steak burger. Since my friend ended up ordering the burger, I figured I should give the Reuben a try. We were shocked when the food arrived. The burger was HUGE... a very big patty on a gigantic bun. Not that the Reuben was much smaller, but it was cut in half so the visual impact wasn't the same. But what an awesome Reuben it was! The rye bread was sliced reasonably thin, and the corned beef came in thick cuts. This has got to be the best corned beef I've had in a long time. It was moist and juicy, with delicious bits of fat on the edges that gave so much flavor to the meat. It was a little bit like eating jamon iberico, in terms of how important the fat was... I was in heaven. Perhaps it was the richness of the fat, but I found myself unable to finish the sandwich and only took in about 3/4 of it. I was tempted to doggy-bag the remainder, but realized that I have a wine dinner tonight and probably wouldn't get around to finishing it until tomorrow. Oh well. I LOVE LOVE LOVE that reuben and yes, their corned is the best in HK (that I've tasted, anyway). 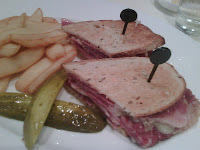 since Dakota's chef originally opened archie b's, the reuben is similar to the way it was there when they first opened. Now that he's gone, they're using corned beef from somewhere else...not boars head from NYC. Good to see the correct sandwich is back.